THERE MAY STILL BE A FEW TICKETS AVAILABLE BUT THEY’RE NO LONGER AVAILABLE ONLINE. PLEASE PHONE THE RESTAURANT AT 802-460-7676 TO PURCHASE. Tickets are $68.00 which includes dinner and its tax and service but not alcohol or its tax or service. The wine pairing [one course of which is a still cider] is an additional $40.00 and needs to be purchased separately. There’s also a full cash bar. If the mountain won’t come to Popolo, Popolo will go to the mountain. On Saturday, September 10, the Bellows Falls community restaurant is presenting an evening in the Great Outdoors at Calvin Coolidge State Park in Plymouth, VT. The night starts with a prix fixe five-course dinner featuring New England game and area vegetables prepared and served by Popolo’s fine kitchen and service staff. Every course comes from area farmers, fisherman, and artisanal producers. Known for both its seasonal menus and its regular events, Popolo is no stranger to this sort of out-of-the-box concept. “We’ll be going off-menu for this event,” reports Tim Cocheo, Popolo’s head chef. “We’re serving a woodsy selection of dishes custom-designed for dining al fresco on the top of a mountain. It’s going to be a once-in-a-lifetime feast in a transcendent open-air setting.” The full menu will be posted shortly. For the true Epicureans a wine pairing is available for an additional $40.00, selected by Popolo’s own wine fairy, Kristen Fehrenbach. Dinner will be served in high style on china and linens in the old Ski Shelter on Bradley Hill. 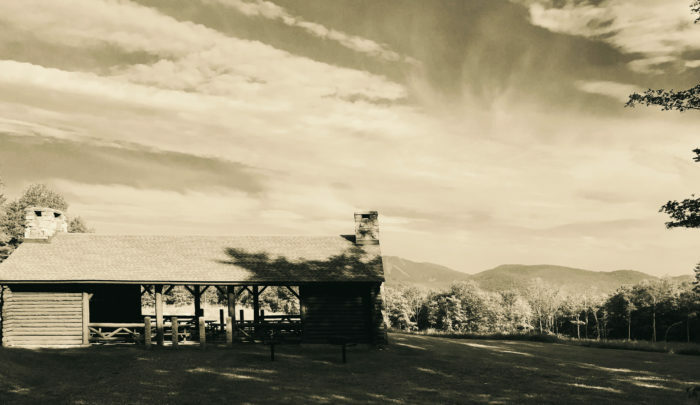 The shelter’s handsomely restored timber construction and two massive stone fireplaces open onto westward sunset views of Killington and the breathtaking grandeur of the Green Mountain National Forest. It’s a setting in which you might find Julie Andrews spinning ecstatically with arms outstretched. But the night goes one better. An unusual choice for a concert in such an unlikely locale, the band jumped at the opportunity. Calvin Coolidge State Park was built in the 1930s by the Citizens Conservation Corp and is one of the most beautiful parks in the Vermont State Park system. The spectacular landscaping highlights 36 adirondack lean-tos, some with unparalleled views of the surrounding mountains and their original stone hearth fireplaces. Reservations are required and seating is limited. Tickets are $68 which includes five courses, the musical performance, and, if you please, camping is free of charge. There’s a full cash bar aptly named “The Moon Saloon” serving traditional and event-specific signature cocktails. Popolo will be closed for lunch and dinner on Saturday September 10, to create this special event in the mountains. If inclement weather causes the cancellation of the event, tickets are fully refundable. Calvin Coolidge State Forest was established in 1925, when Perry Merrill (then head of State forests and parks) arranged the purchase of a tract of land in Plymouth He was successful in obtaining funds for the property due to the great public interest in the Coolidge family and popularity of Plymouth Notch. Camp Calvin Coolidge, located in Calvin Coolidge State Forest, was established June 9, 1933 as the third Civilian Conservation Corps (CCC) camp in Vermont. The original Coolidge State Park was built solely by the CCC. They also completed a network of forest highways and carried out extensive reforestation projects. Much of what is now Coolidge State Forest was once cleared for tilled land and pasture, as evidenced by extensive stonewalls and many foundations. In the late nineteenth century there was a small town immediately adjacent to Coolidge State Park (later becoming part of the Forest). Businesses once located there included a store, blacksmith shop, and a hotel. There are 36 lean-to sites and 26 tent/RV sites arranged in two camping loops. There are four rest rooms providing modern plumbing, two of which have hot showers ($). There is a large picnic shelters and group camping area. There is also a nature center, horseshoes and a play area. There is a sanitary dump station for RVs, but no hookups. Many day hikes are available in the park. There a several hiking trails, volleyball and a group camping area in the park.